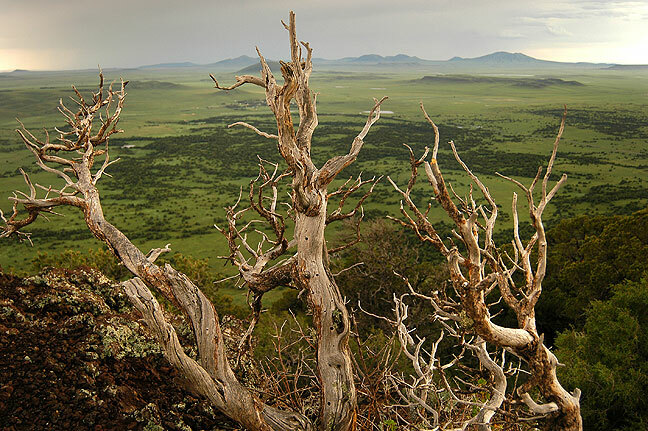 This view looks north across the rim of Capulin Volcano, New Mexico. I made a point to find the location of a wind farm I saw growing over the years, at White Deer, Texas. 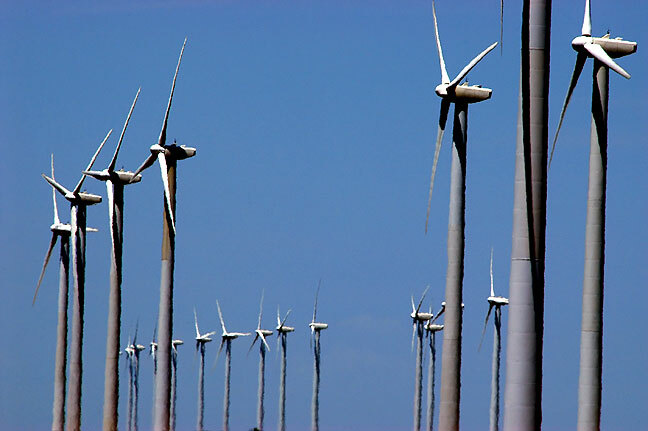 I was able to enter and photograph the wind farm. 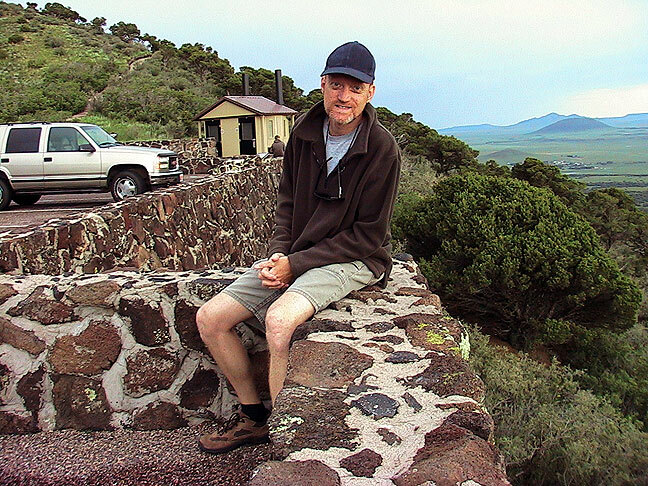 Despite having a head cold, your host explores Capulin Volcano in northeastern New Mexico. By 4:30 I was at Capulin Volcano National Monument, which I hiked. The site was familiar from the 1999 visit, but the light was entirely different due to a huge thunderstorm that had just passed through. I arrived in the Raton-Clayton Volcano Field in the midst of a clearing summer thunderstorm. 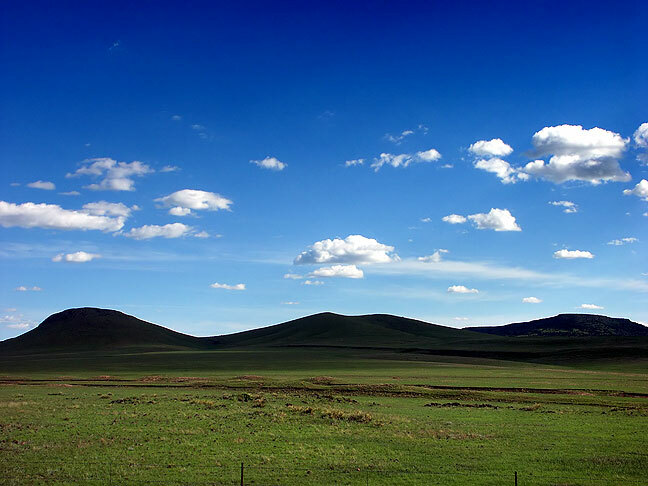 By the time I reached the Capulin Volcano, it had drifted to the south. 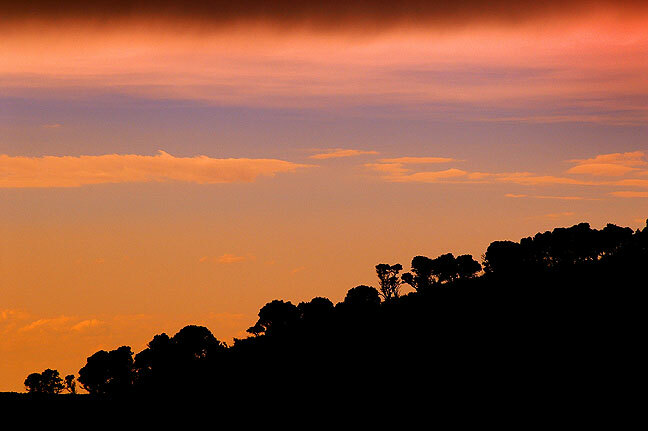 The air was clear, and had that smell of high country air after a rain. This is another view of the sprawling thunderstorm that made my Capulin Volcano light so interesting. 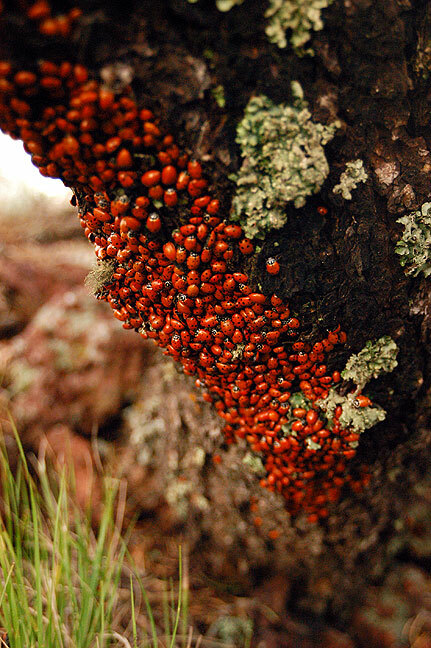 The top of the rim of the Capulin Volcano National Monument, New Mexico, is the home to thousands of migrating ladybugs each summer. 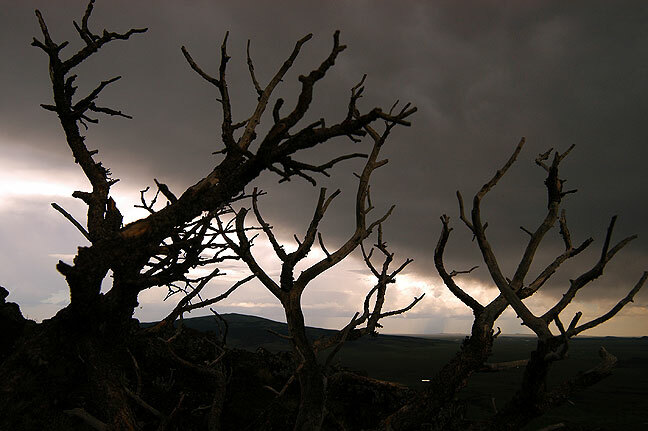 I had photographed this dead tree, at Capulin Volcano National Monument, in 1999, but on this occasion, after a thunderstorm, the light was entirely different. 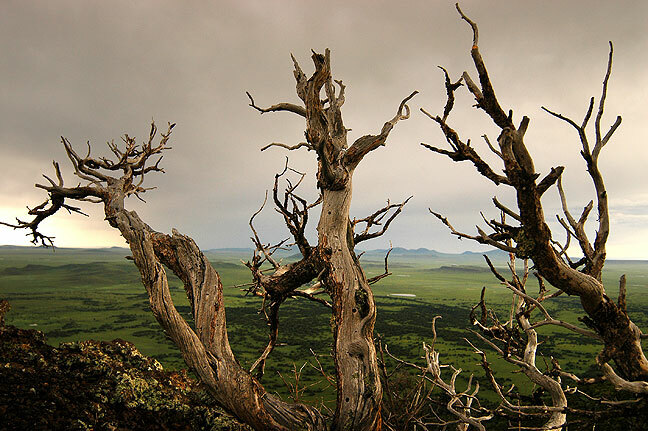 This is another view of the tree on the south rim of Capulin Volcano. 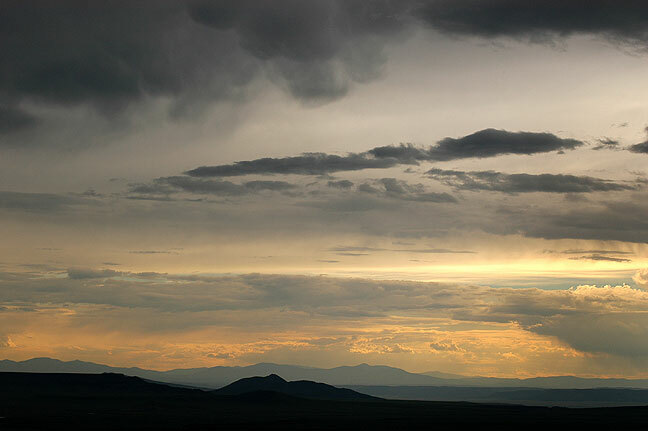 Looking west from Capulin Volcano after a thunderstorm passed resulted in this beautiful landscape of the Folsom Volcano Field. 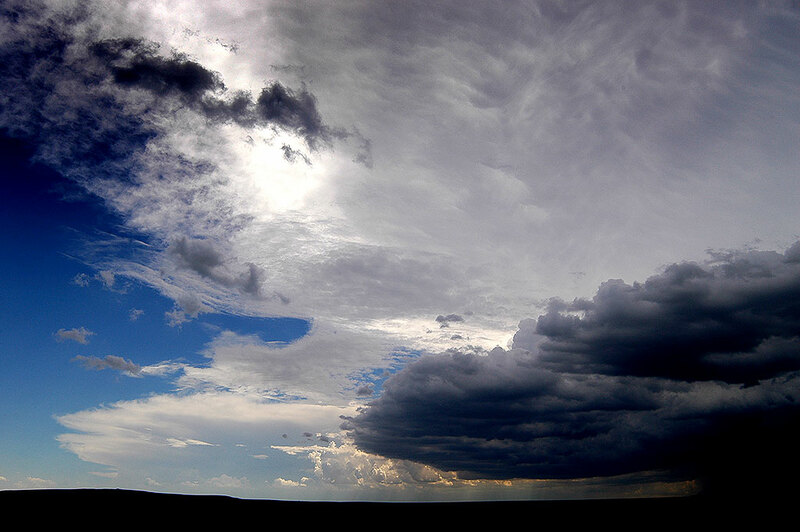 The retreating thunderstorm at Capulin Volcano National Monument created very moody skies. I arrived at Great Sand Dunes National Monument by mid-morning and hiked the Point of No Return trail, Mosca Pass trail, and Sand Pit trail. 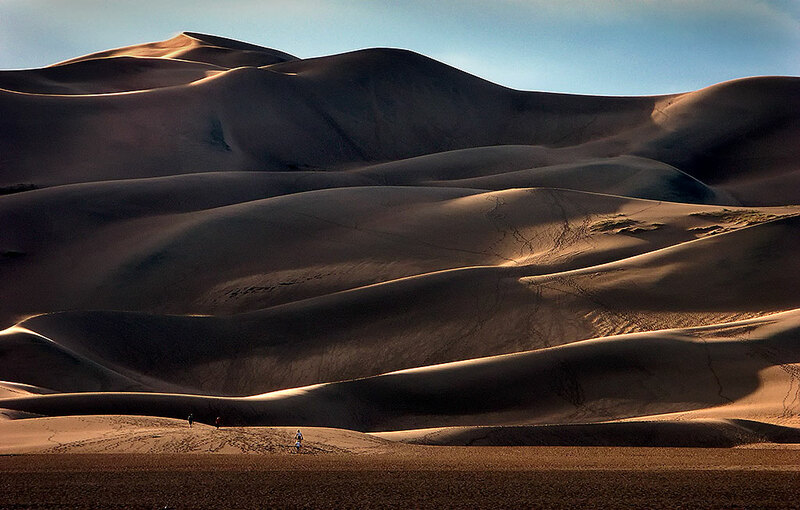 This is one of my favorite images of Great Sand Dunes due to the presence of people and tracks showing how huge the dune field is. 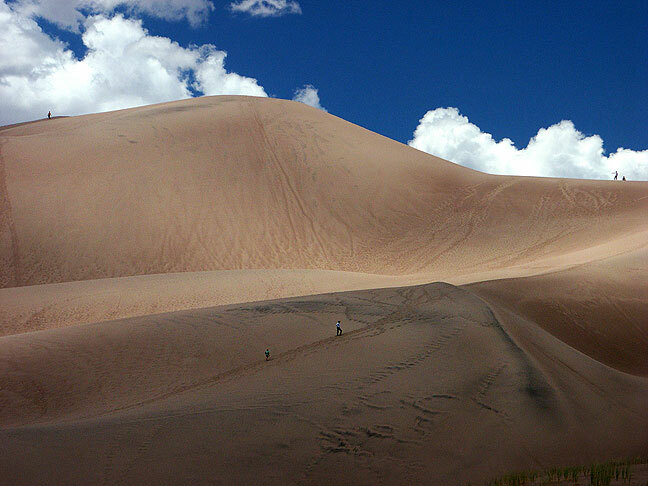 The Sandre de Christo Mountains soar above Great Sand Dunes. A bumble bee harvests from a flower on the Mosca Pass trail in the soaring Sangre de Cristos Mountains above Great Sand Dunes. This view looks downhill from about three quarters of the way up to Mosca Pass, which is about 10,000 feet. I was turned away not long after making this image by poison ivy covering the trail. 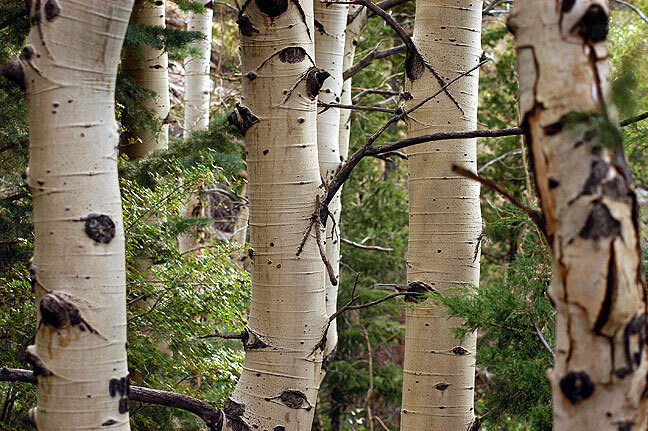 Aspens line the Mosca Pass Trail. Near the bottom of the Mosca Pass Trail a stream runs through the forest floor. 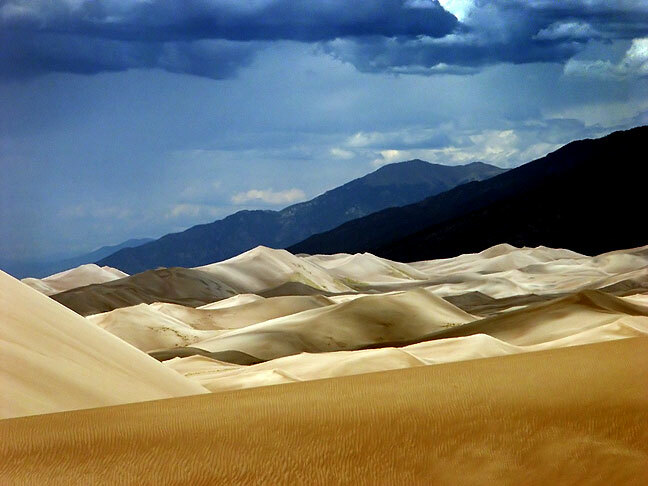 Great Sand Dunes National Monument, Colorado. 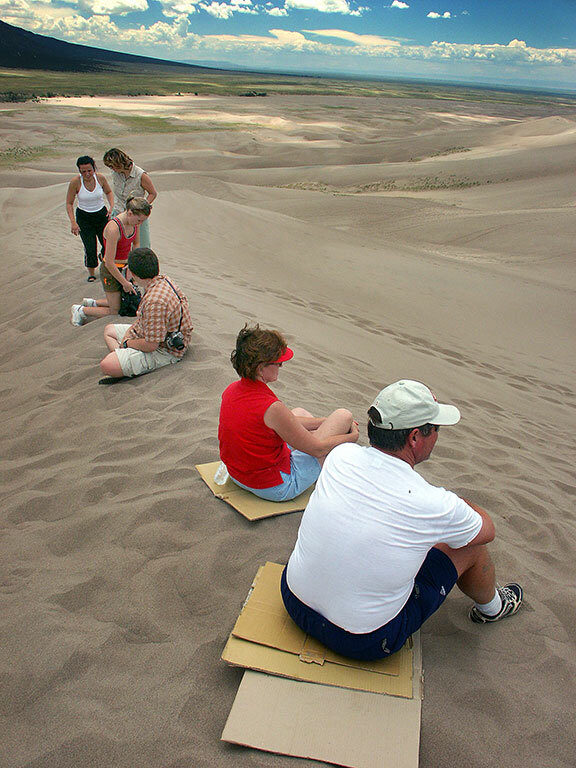 Visitor sit on cardboard during the day at Great Sand Dunes. Unlike White Sands in New Mexico, darker sand gets very hot in the sun. 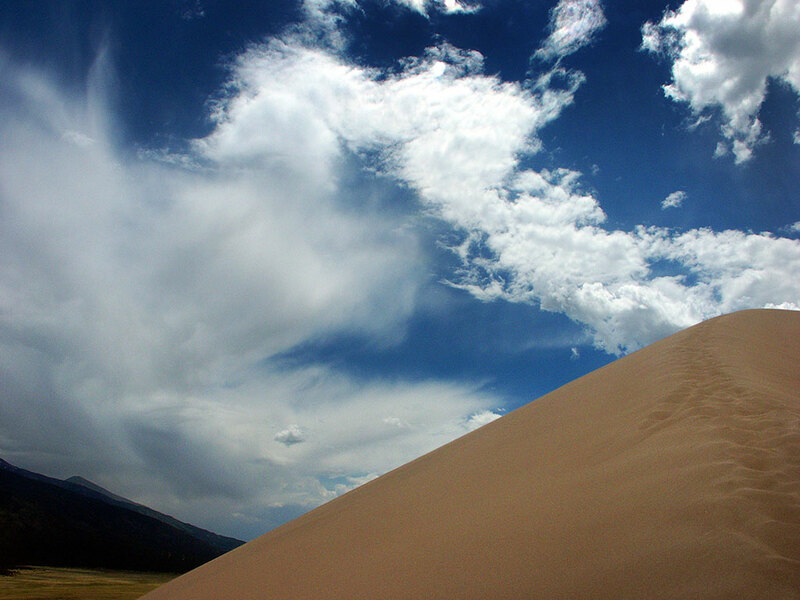 I made this image on my way up High Dune at Great Sand Dunes. There are people in this image for scale, though it should be noted that all of them gave up before reaching the top. 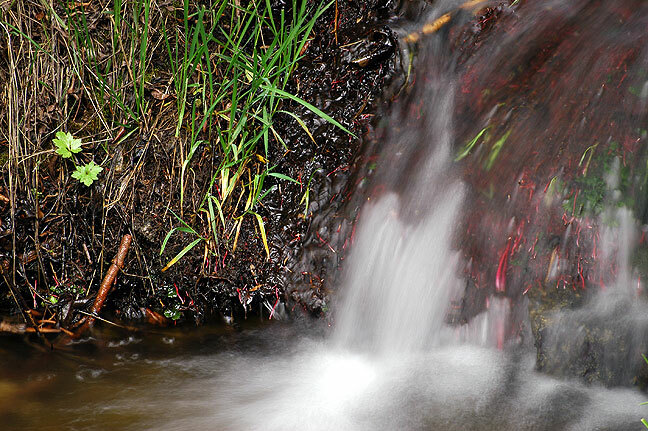 Medano Creek is nearly 100 yards wide and seldom more than a few inches deep. 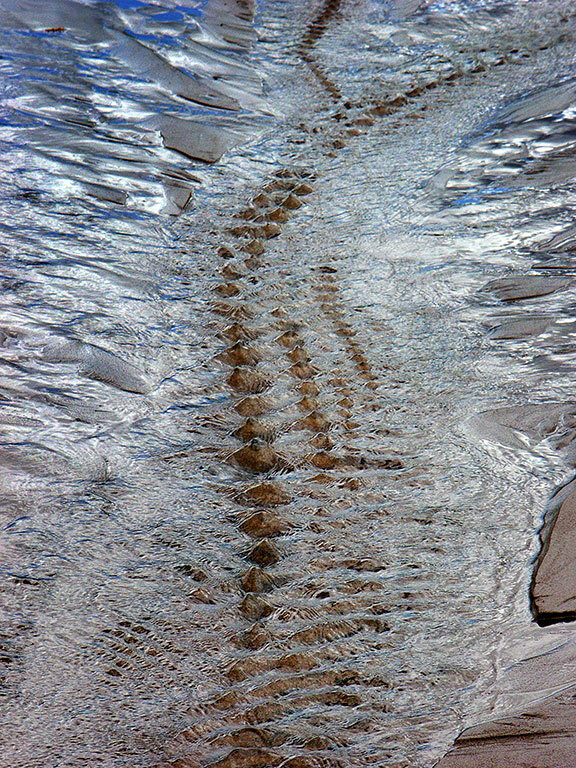 It is unique in that it disappears into the sand a few miles downstream. 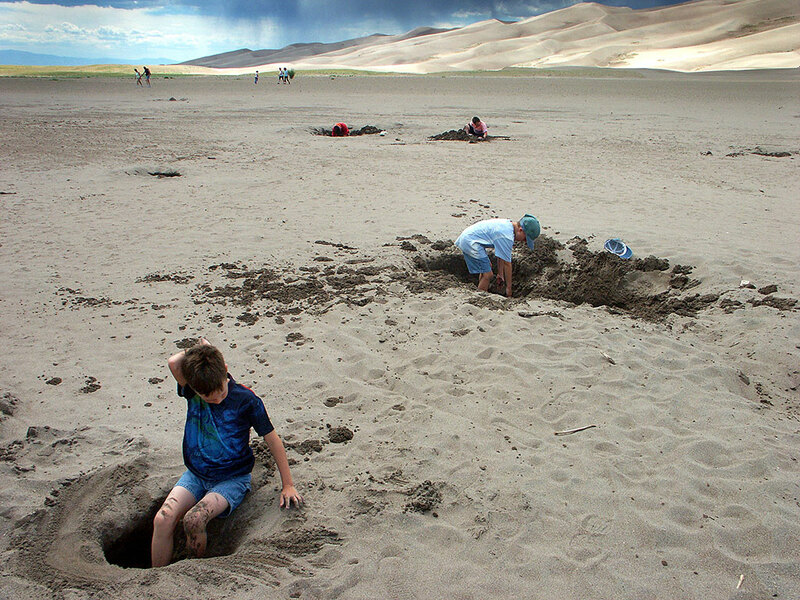 Children play in the sand flat near Medano Creek at Great Sand Dunes. It could be thought of as the ultimate sandbox. 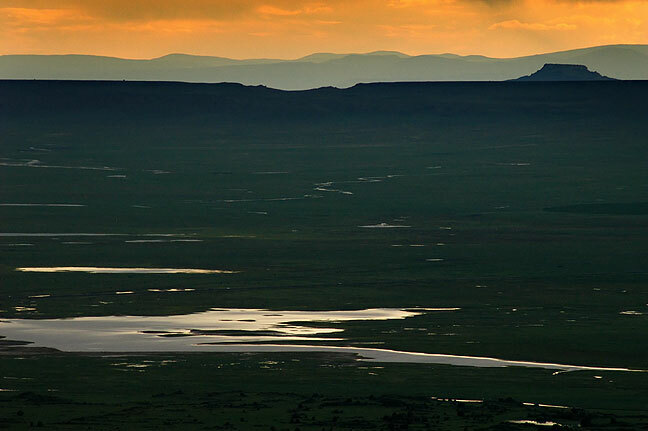 From High Dune, you can see much of the expansive dune field to the north and northwest, as well as the Sangre de Christo Mountains. I took a more southernly route down from High Dune. 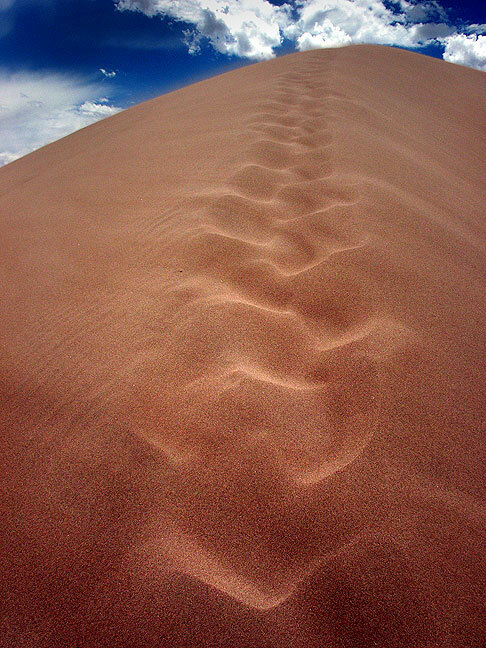 As you can see, the angle of repose of the dunes is quite steep, making climbing them physically demanding. 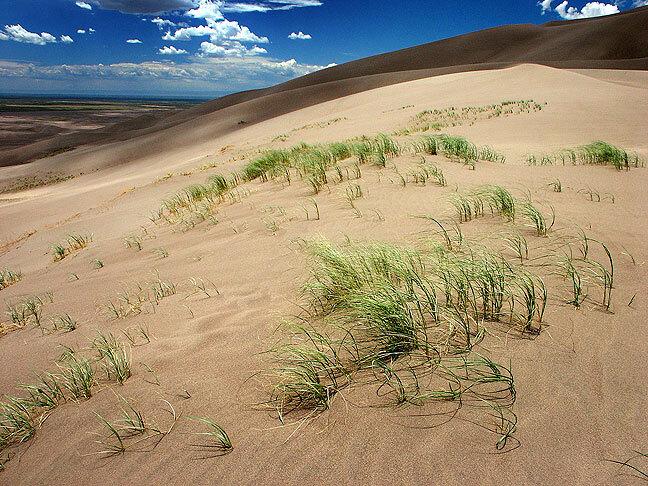 Areas of shallow grasses cling to sand at Great Sand Dunes. 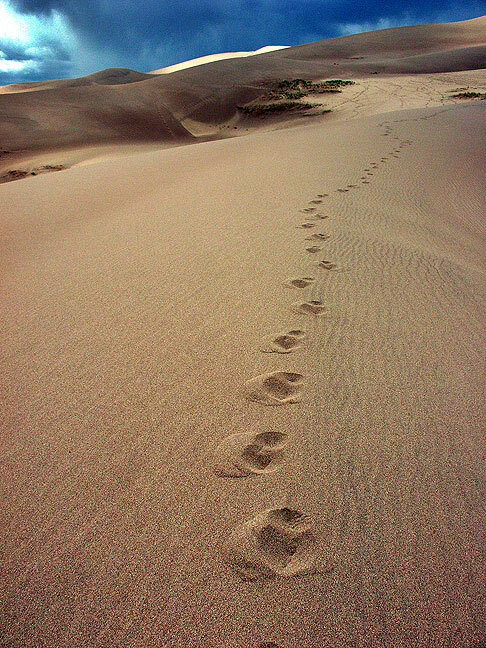 My footprints in the sand; since the sand is dark, shoes are a requirement due to daytime heat. Late afternoon light on the dunes. 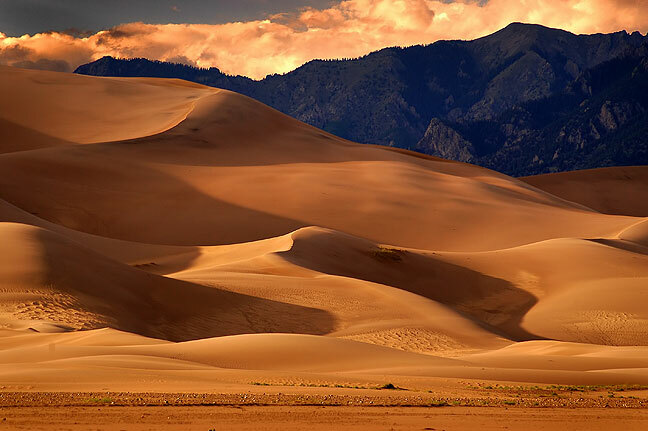 Set against a backdrop of the Sangre de Cristo Mountains of southern Colorado, some of the dunes reach 750 feet high. 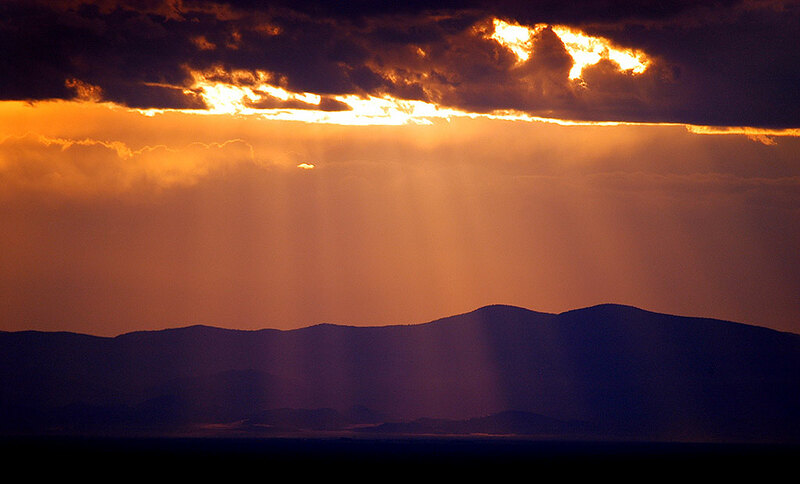 Crepuscular rays form as the sun ducks behind clouds as evening approaches in the San Luiz Valley of southern Colorado. I sat in my camp chair along Colorado 150 for more than an hour waiting for the sunset. I also hiked to the top of High Dune, which is difficult because the sand itself is so loose. I was more alone the higher I went; I didn’t see anyone at the top. The sand was blowing fiercely on the dune peak. I ended up in Alamosa, Colorado, for the night, as sandy as I have ever been. 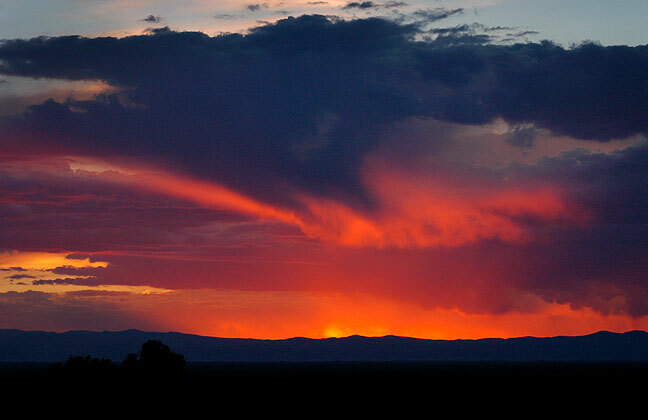 Clouds turn deep red and orange after sunset in the San Luis Valley of south-central Colorado. 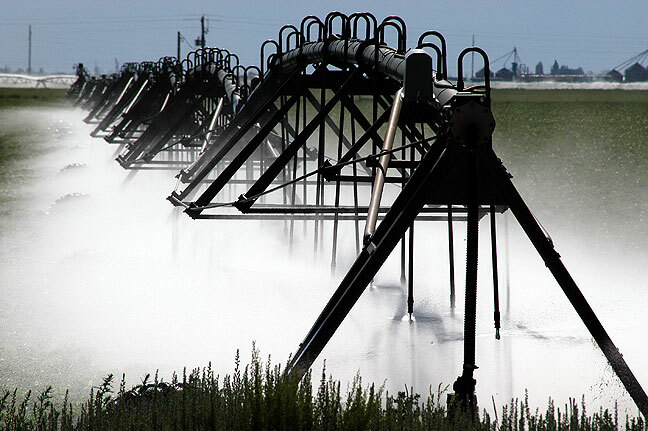 I ran across these sprinklers in a highly cultivated area north of Alamosa, Colorado. 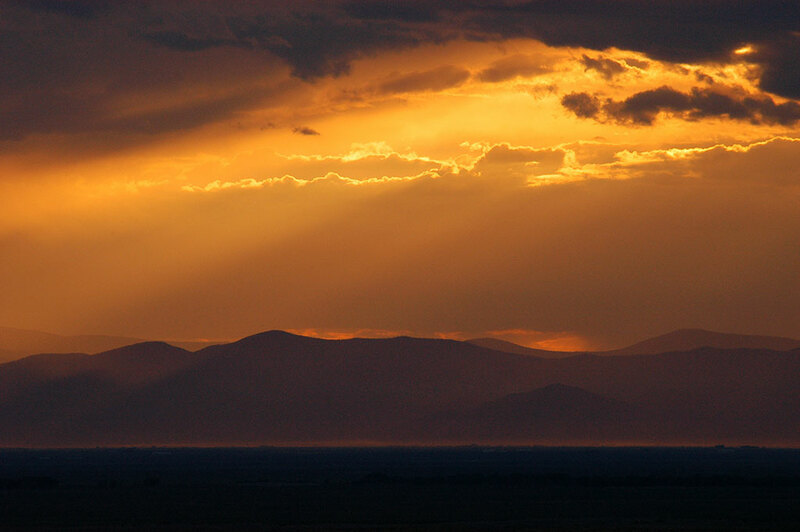 The drive north from Alamosa was fun but made few pictures. There were lots of hairpin turns and alpine scenery that made the drive challenging and entertaining. 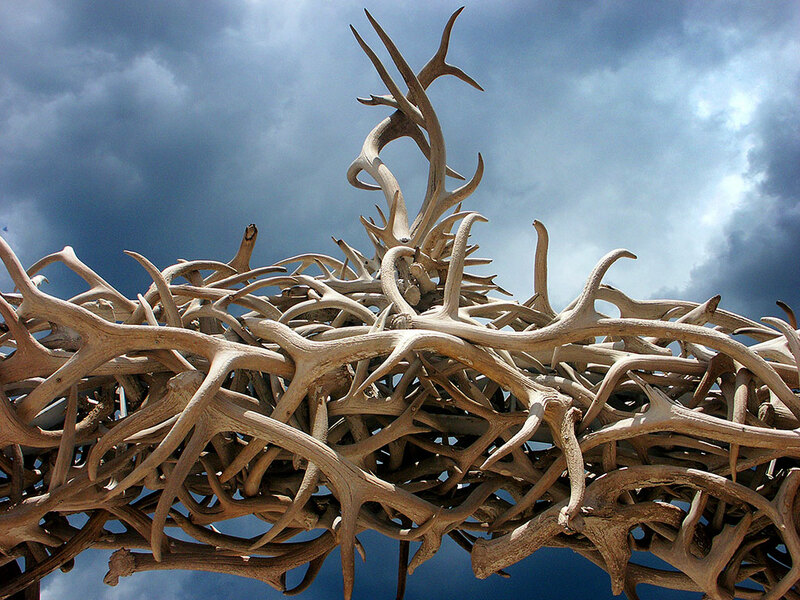 I spotted this antler archway on my drive to Black Canyon of the Gunnison. Beautiful landscapes like this are the reason the drive from Great Sand Dunes to Black Canyon of the Gunnison is never boring. 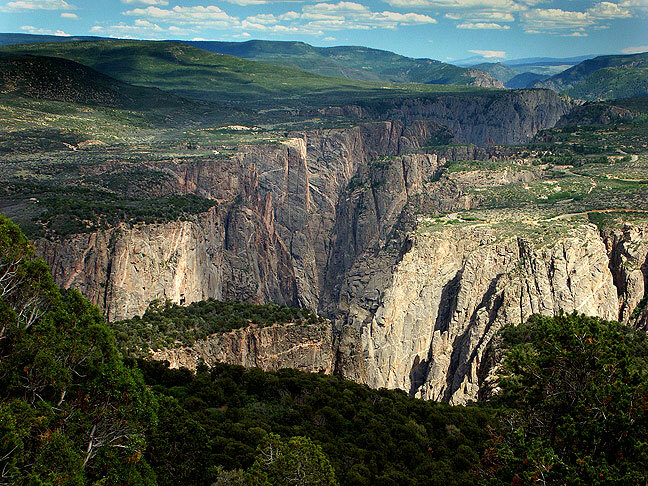 Black Canyon of the Gunnison is named for its dark stone and usually-shadowed light. 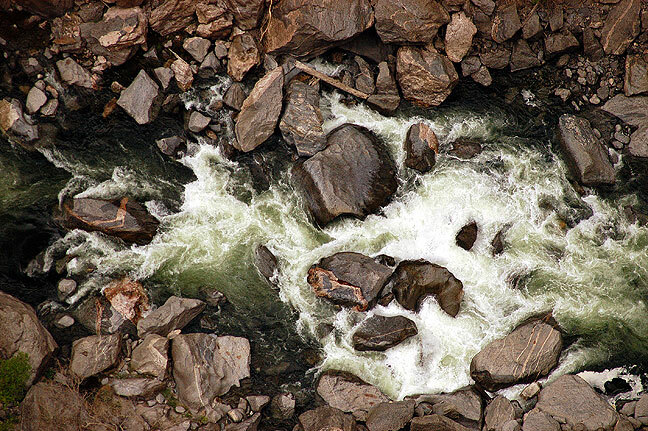 This view looks straight down, and helps give the impression of the depth of the feature. I was at Black Canyon of the Gunnison National Park by 1 pm. At the north rim ranger station, I had to change the date on their stamp because no one had used it. While reserving a camp site, I found I had my pick of all 13. I hiked the 3.5-mile North Vista Trail to Green Mountain, which offers excellent views of the entire canyon. In the four hours up and down, I never saw anyone else. 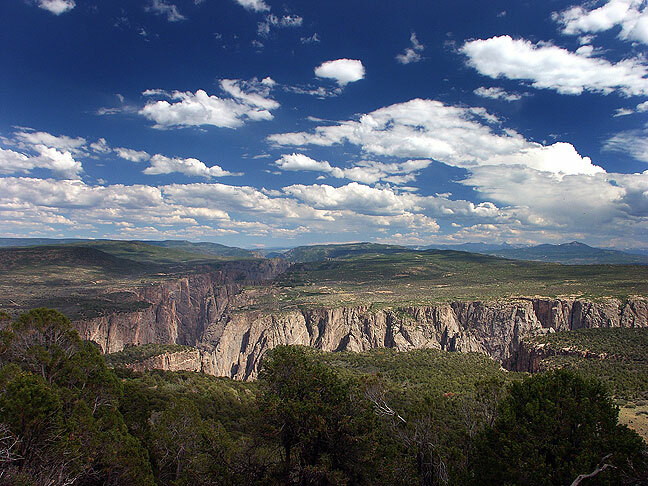 This view is from Green Mountain at the top of the North Vista trail, looking east, at Black Canyon of the Gunnison. 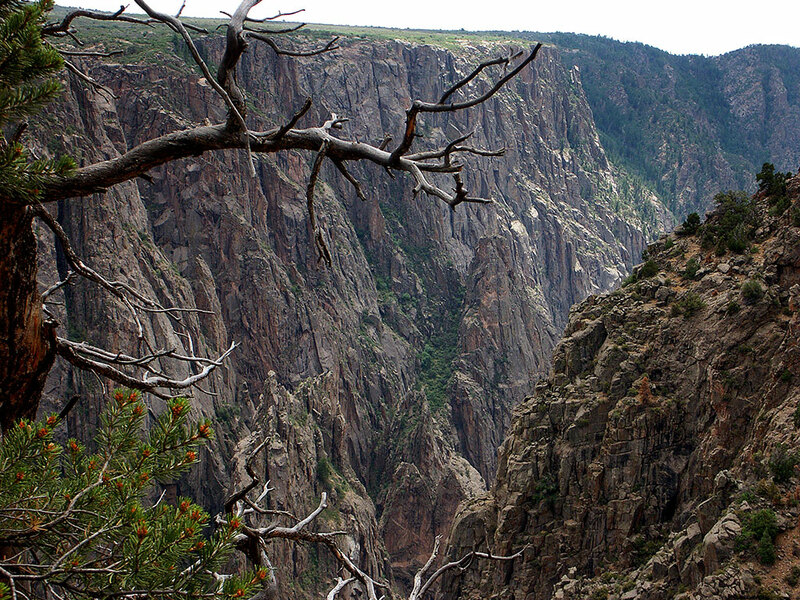 Looking back at Black Canyon from the North Vista trail affords this excellent view. 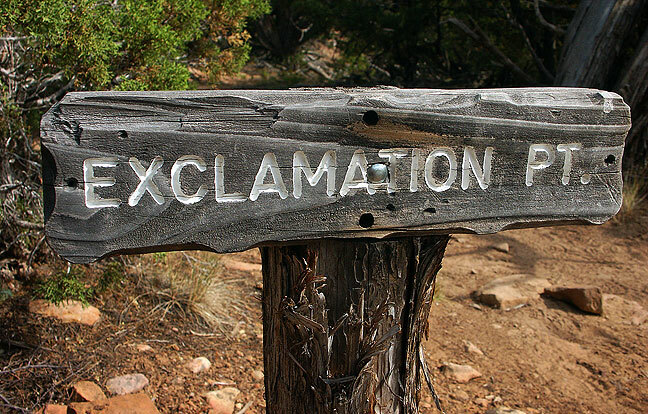 The spot is called Exclamation Point! 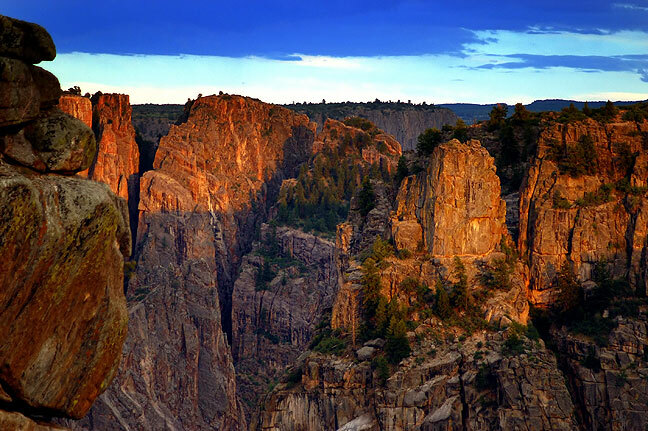 Although black in appearance during daylight hours, last light at Black Canyon brings out its amber hues. 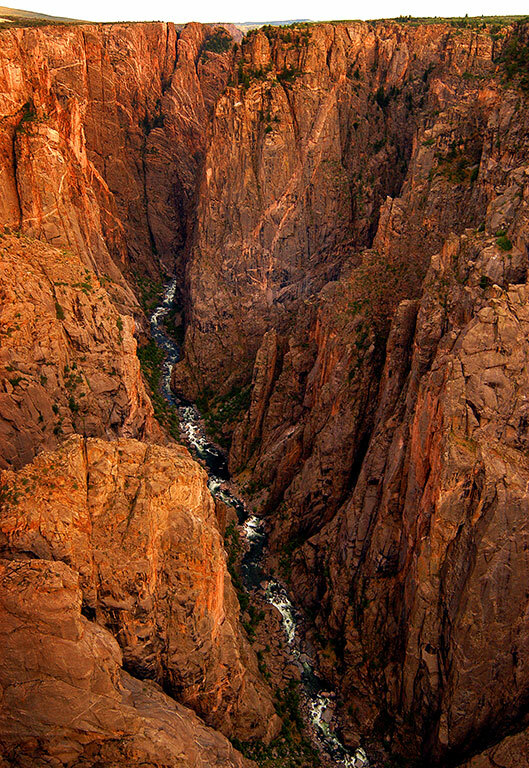 Last light filled Black Canyon with color. 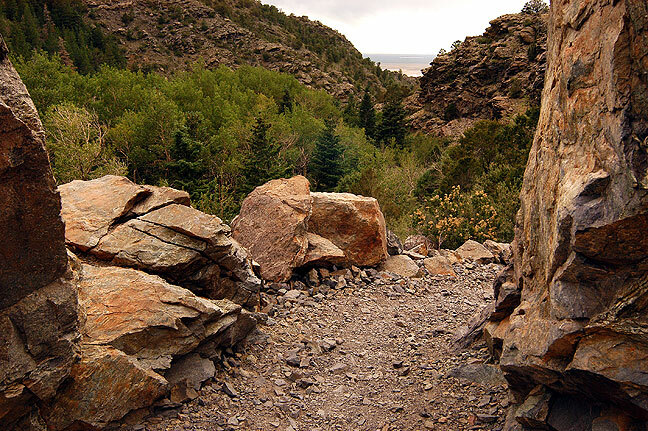 It’s a rare pleasure to find trails with funny names, like this one at Black Canyon of the Gunnison. There was no cell phone service in the canyon, but I got it suddenly from up high. I called my fiancée Abby and told her I couldn’t call later. I slept well in my nearly-private camp site. 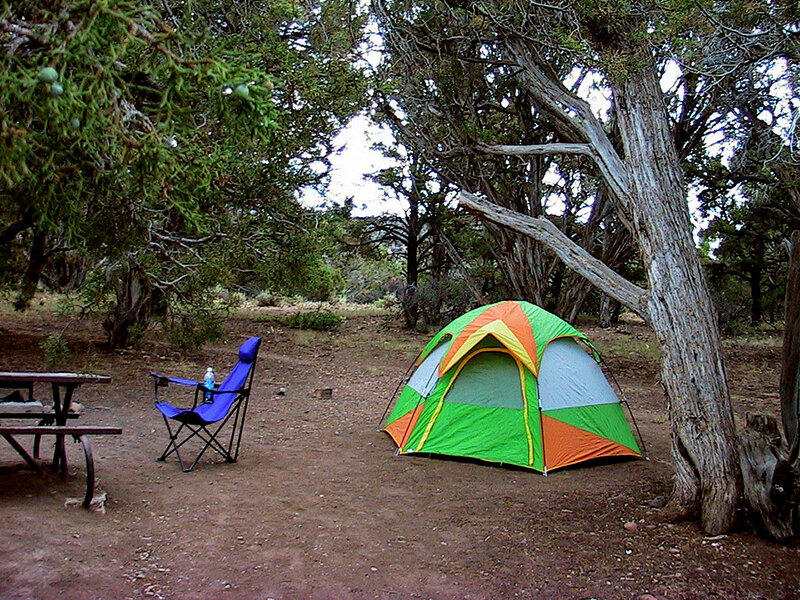 This was my modest camp site on the North Rim of Black Canyon. I had my pick of 13 sites. 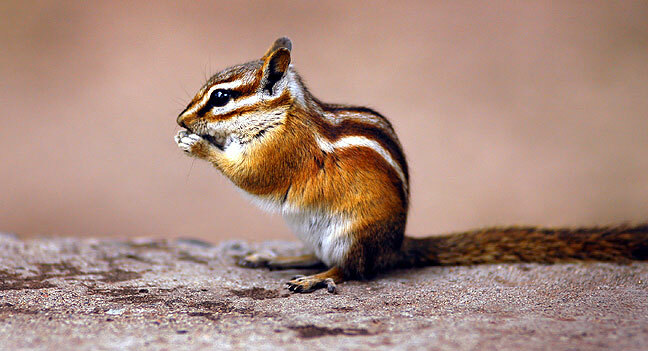 This was my only visitor for the night at Black Canyon’s North Rim Campground. 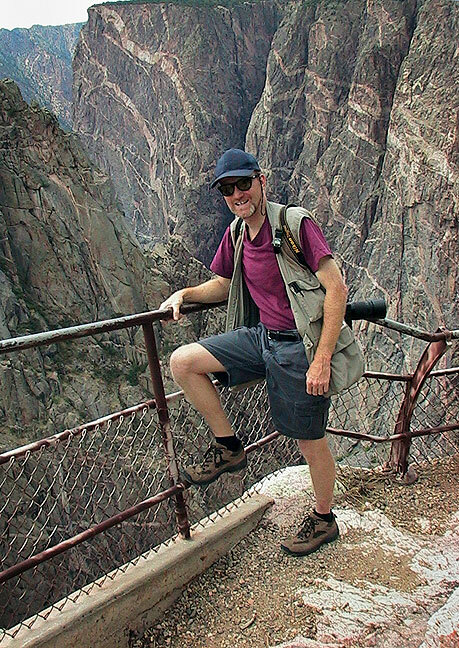 Your host poses at the north rim of Black Canyon of the Gunnison. 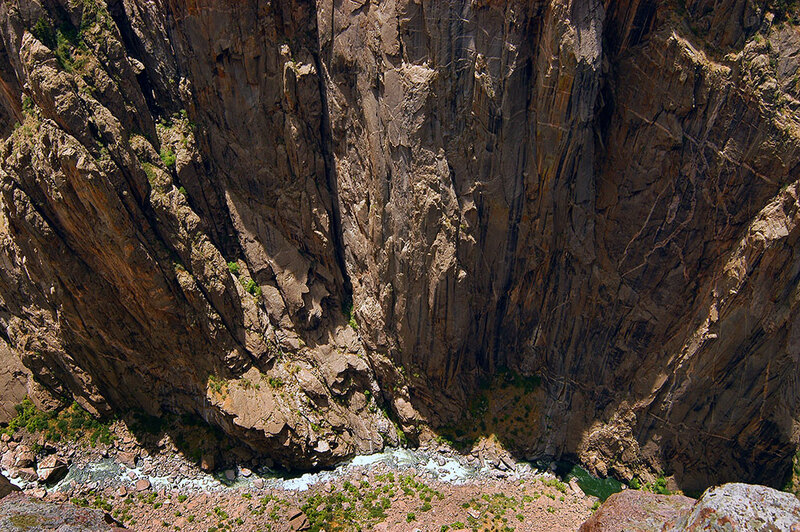 This view looks straight down Black Canyon of the Gunnison. 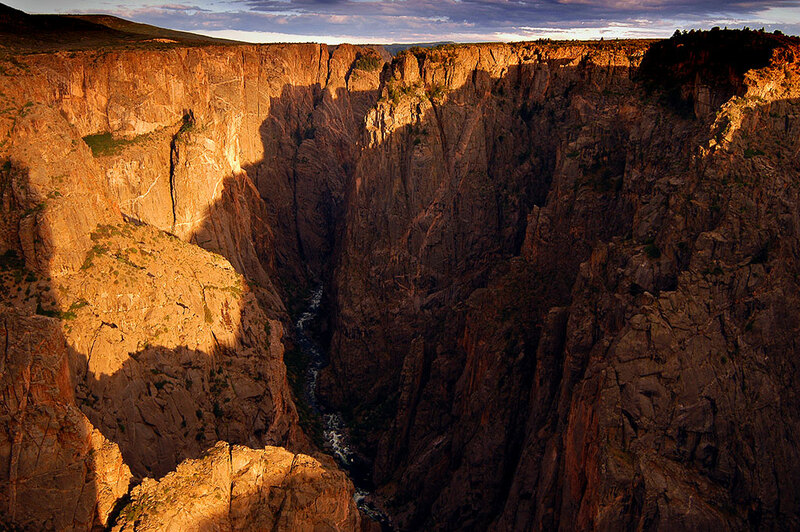 This view looks west across Black Canyon at sunrise. 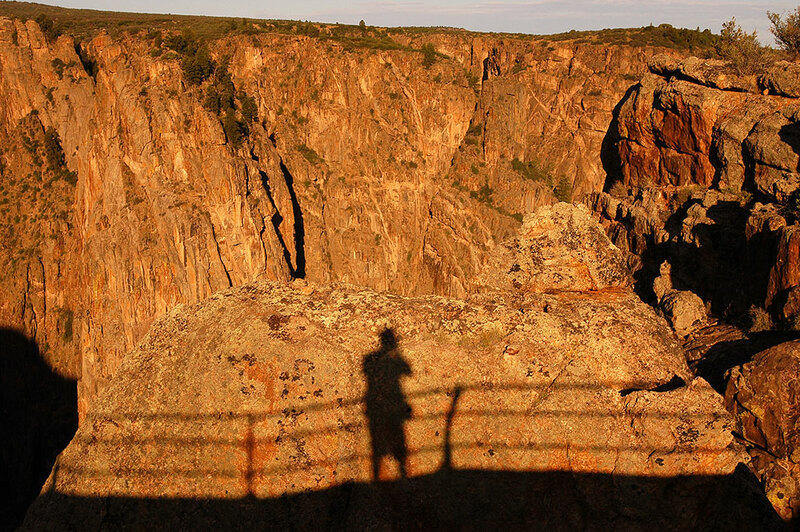 Your host’s shadow at first light creates a self portrait at Black Canyon of the Gunnison. 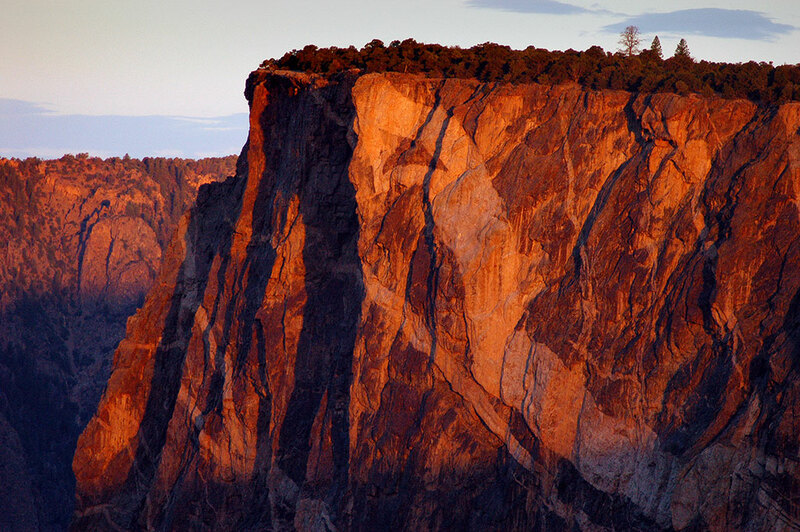 The “serpent” of Serpent Points is very obvious in this view of Black Canyon of the Gunnison at first light. 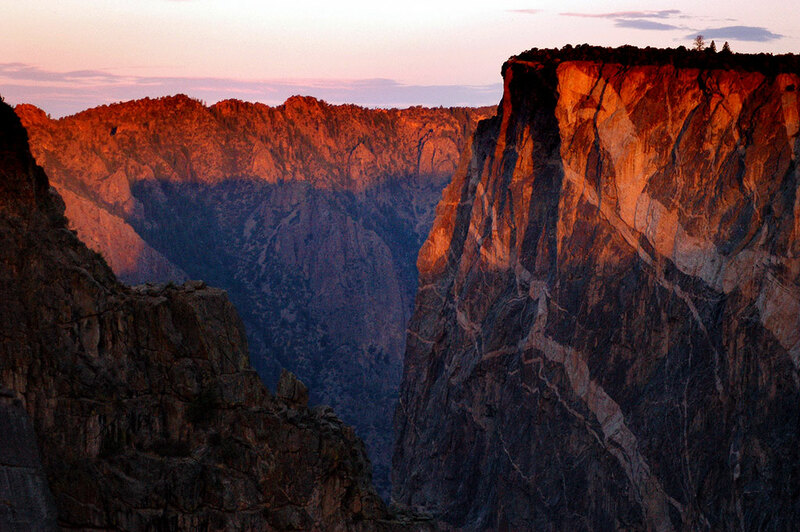 This slightly wider view of Black Canyon reveals the excellent sunrise color. Up before dawn, I broke camp and drove to Colorado National Monument. 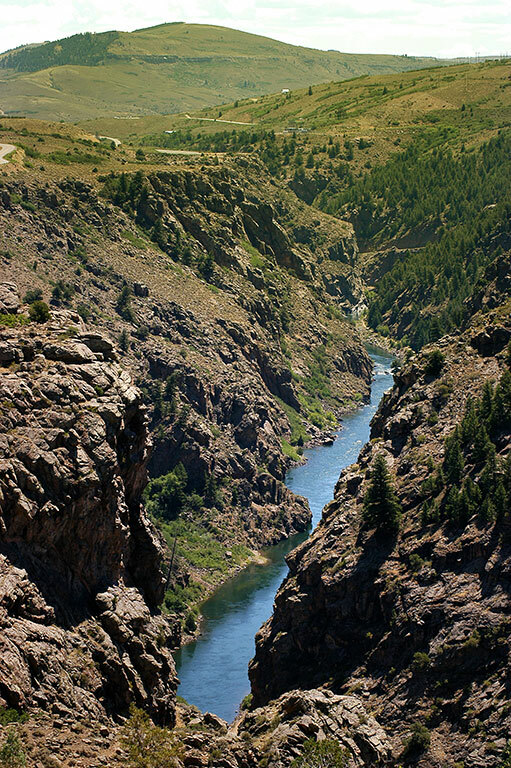 The Gunnison River winds through west-central Colorado. The drive from Black Canyon to Colorado National Monument is beautiful. I found unrelenting heat, fair light and some very interesting popcorn thunderstorms that made good pictures. I hiked a few short trails. One of the signature formations of this park is the Coke Ovens. In the distance to the north are the Book Cliffs. 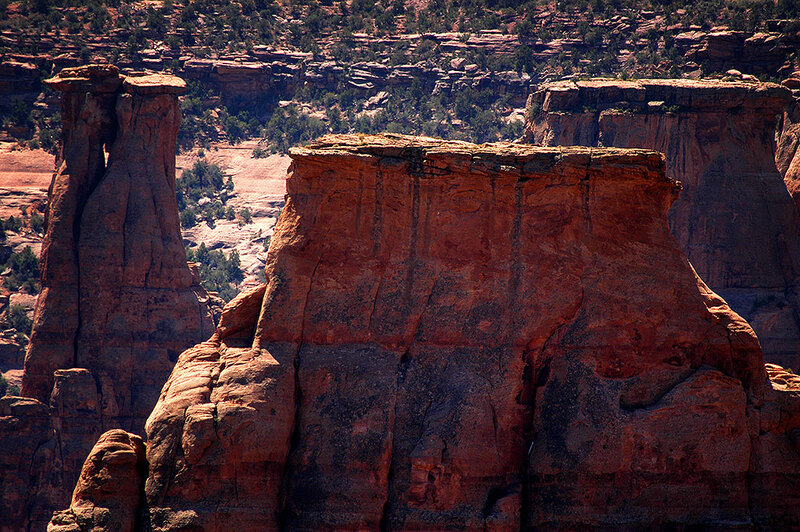 Window Rock, Colorado National Monument, viewed from the Book Cliffs overlook. 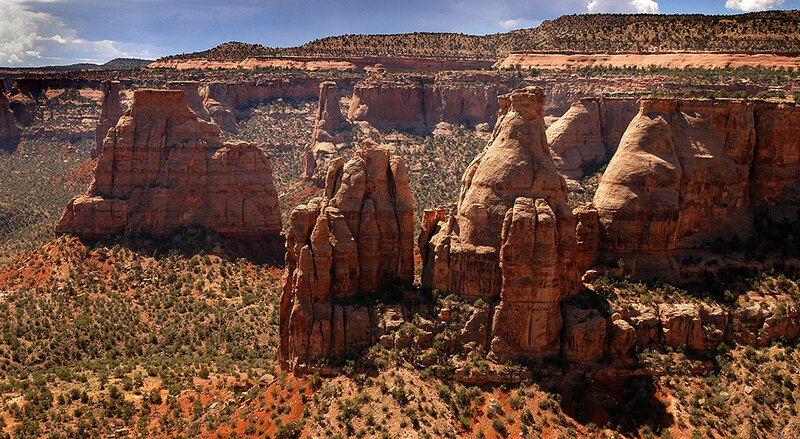 This medium view from Book Cliffs View shows the majestic monuments at Colorado National Monument. 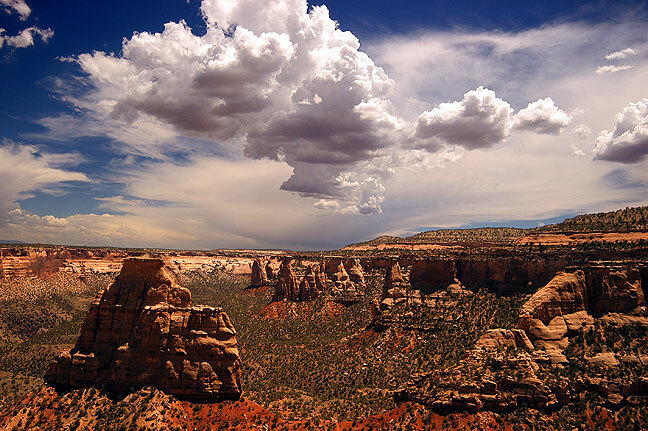 A tighter frame shows one of the monuments of Colorado National Monument in repose. I would have explored more of the area but was turned away by oppressive heat. Sandstone pinnacle with the town of Grand Junction, Colorado in the background. 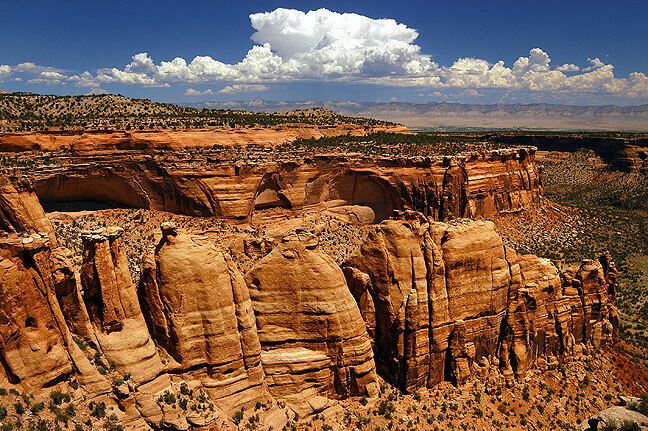 Panorama of Monument Canyon with Independence Monument in the center. 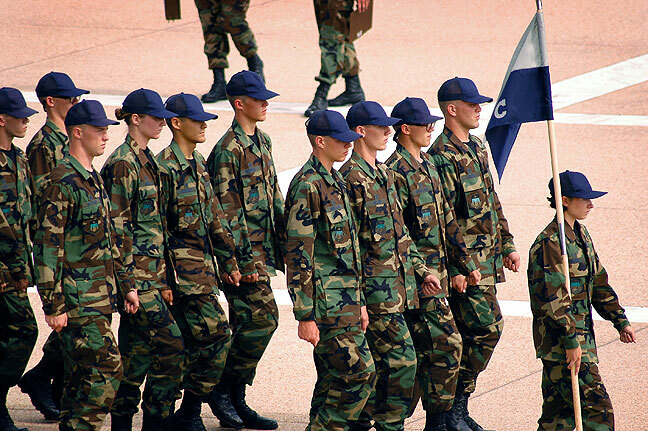 Air Force Cadets march at the Air Force Academy in Colorado Springs. I slept until 7 am in Denver, then headed south. 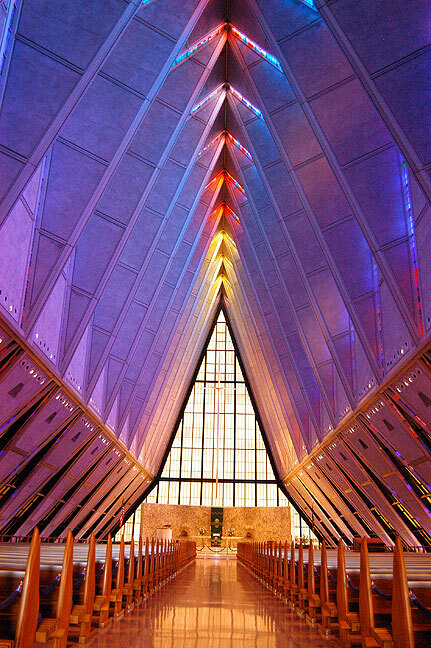 In Colorado Springs, I saw a sign for the Air Force Academy, where I stopped and shot their very beautiful chapel. The Air Force Academy Chapel was one of the best surprises on this trip. I only shot it because I saw a sign for it as I drove south of Denver. 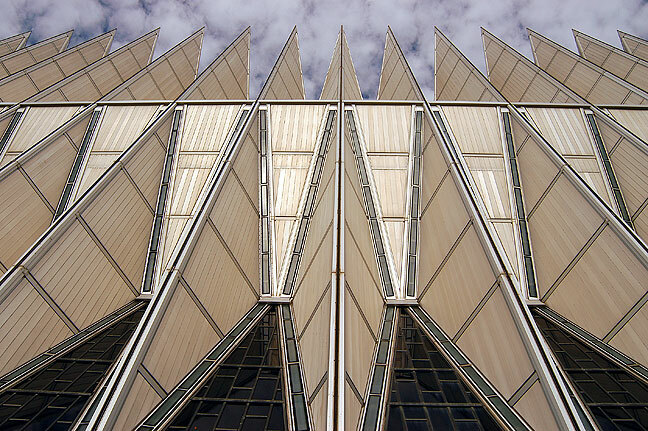 The Air Force Academy Chapel is extremely photogenic. 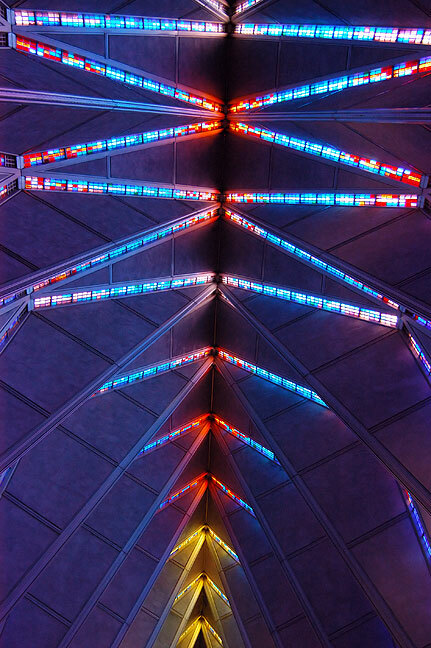 Stained glass fills sections of the ceiling at the Air Force Academy Chapel. The architecture is reminiscent, to me anyway, of that of Frank Lloyd Wright. 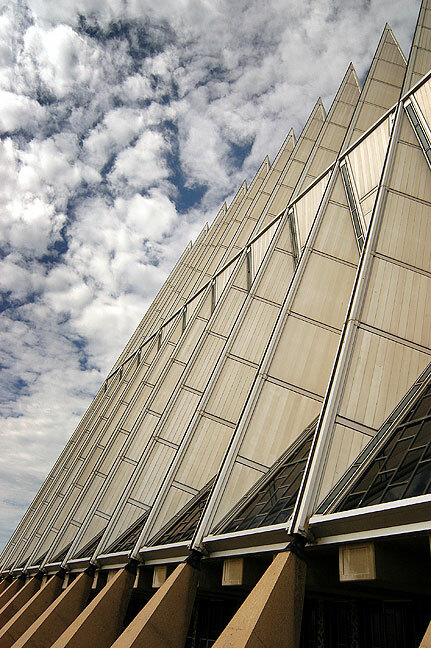 Another view of the exterior of the Air Force Academy Chapel shows its edgy appearance against the sky. 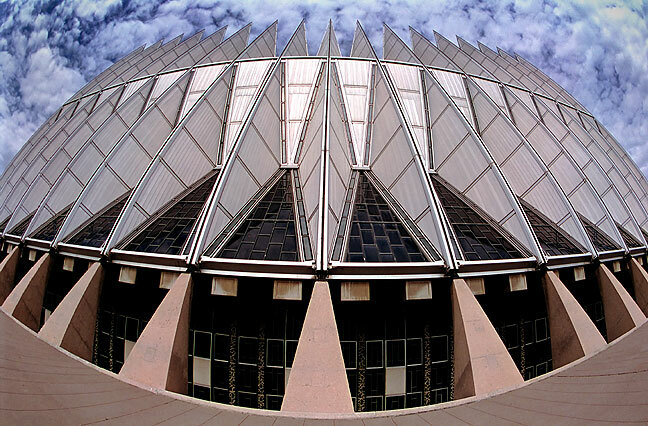 This is a fisheye view of the exterior of the Air Force Academy Chapel at Colorado Springs. 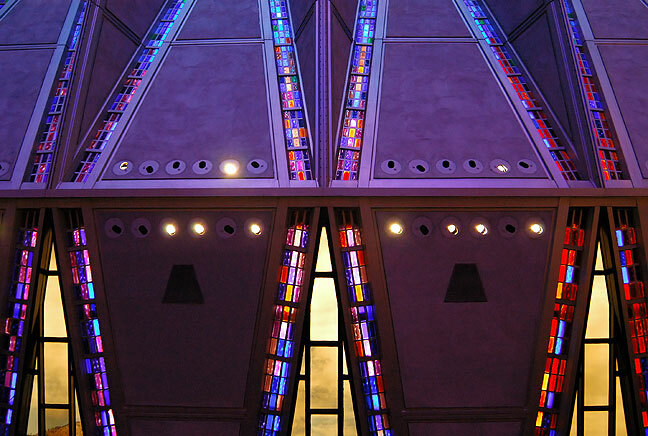 The Air Force Academy Chapel’s stained glass collects morning light in this interior view. Garden of the Gods is a little domesticated for my taste, but it still made pictures. 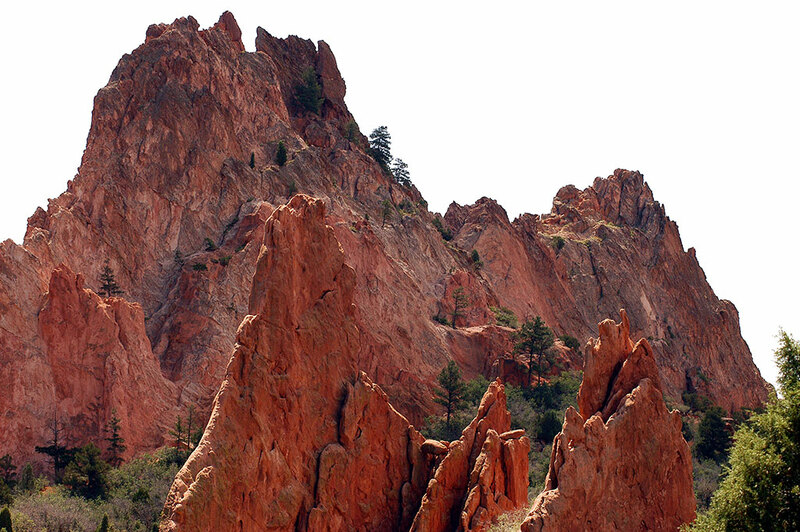 Also in Colorado Springs, I hiked around Garden of the Gods for about an hour. It was crowded, but not bad for a city park. 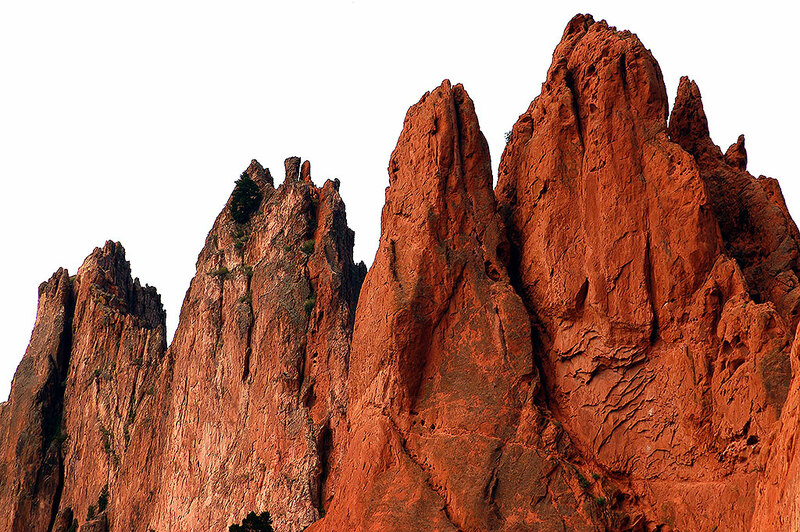 Peaks of Garden of the Gods stand against a bright sky. 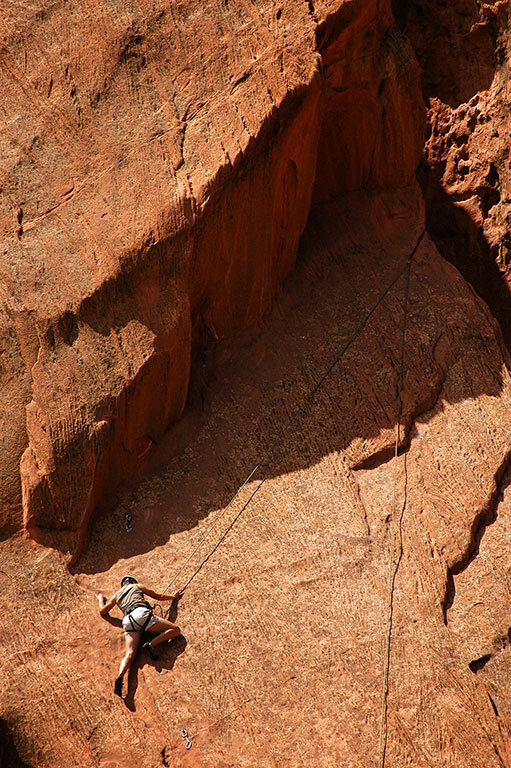 In addition to paved trails and easy walking, I was surprised to see rock climbers at Garden of the Gods. 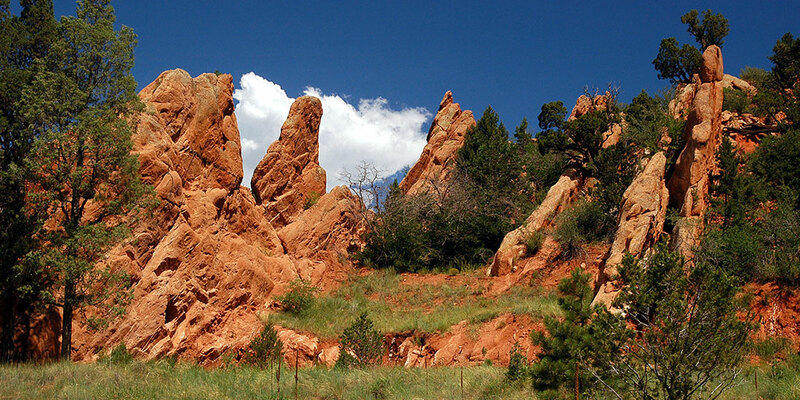 The light varied between blue sky and cloudy sky during my stroll at Garden of the Gods. 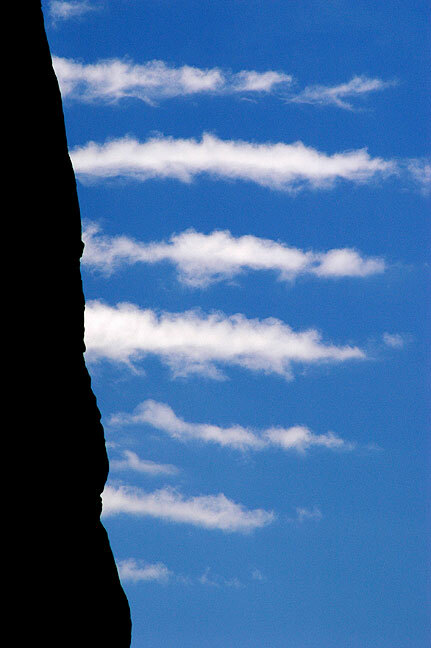 I spotted this unusual confluence of cliff and cloud at Garden of the Gods in Colorado Springs, Colorado. 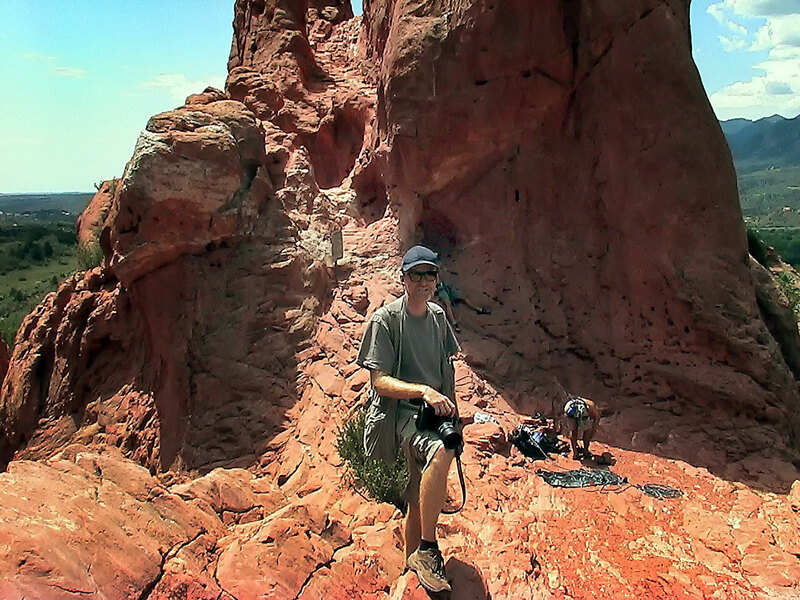 I asked a fellow tourist to make a picture of me near some rock climbers at Garden of the Gods. 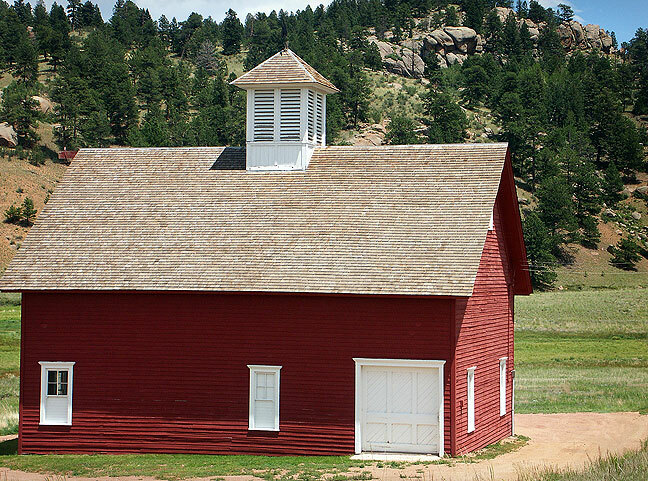 Florissant Fossil Beds National Monument included this handsomely restored homestead. I slipped over the mountains for a peek at Florissant Fossil Beds National Monument, which wasn’t very interesting or very photogenic. I shot several more images on the rest of my drive to Amarillo. A tremendous volume of insects collected on the nose of my Grand Am. 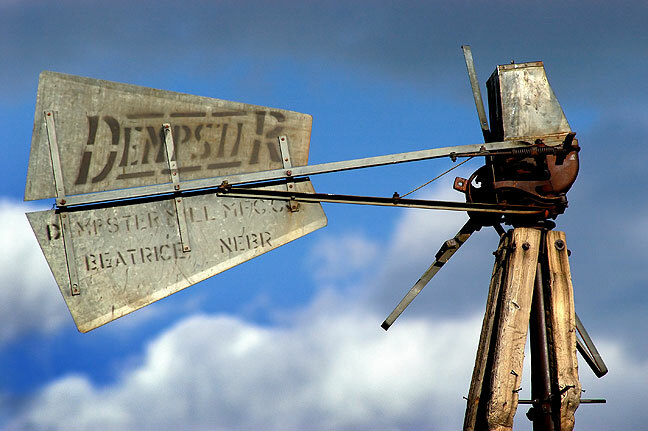 I came across this broken windmill in far northeastern New Mexico. Abandoned farm house, Perico, Texas. 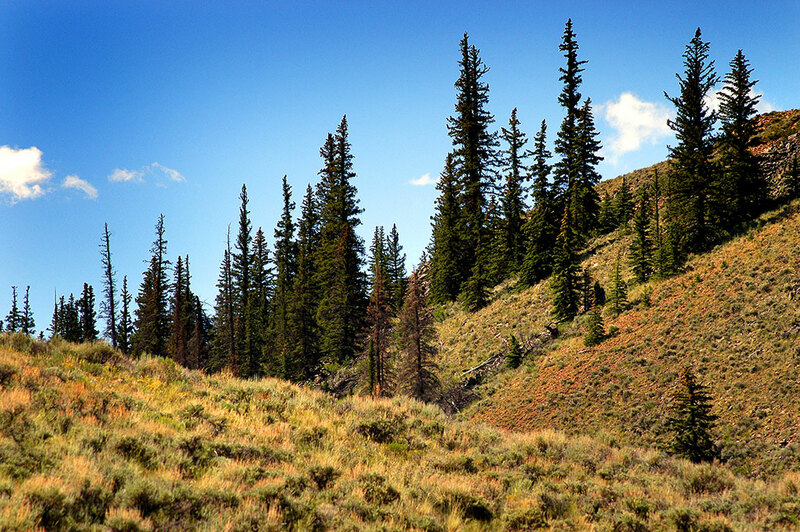 This view shows some of the slopes of the Folsom Volcano Field in northeastern New Mexico. 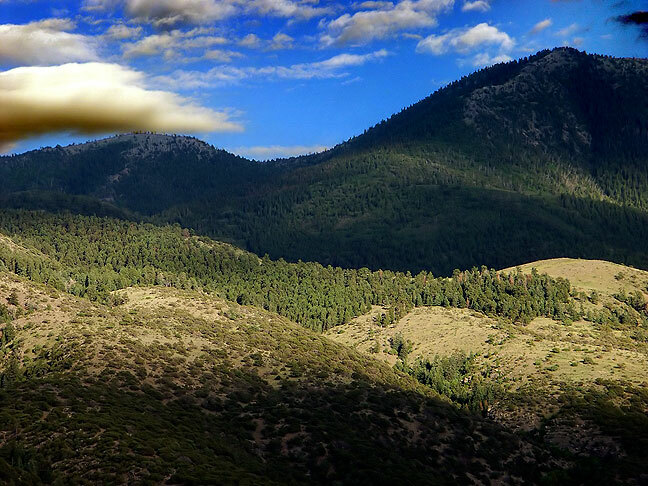 Thunderstorm near Sierra Grande peak, New Mexico. The most SPECTACULAR outdoor photography I’ve seen. What a beautiful blog entry. I had not seen it before today. Amazing stuff. The three-dimensional quality to these images is above par even for you. Having seen the Air Force Academy in person (1989), I know it’s indeed impressive — especially the chapel. You photographed it well. Our tastes differ; I think that chapel is…well, not quite ugly. Let’s just say that, as houses of worship go, it makes a great planetarium. This seems to be one of your greener, lusher excursions. Would you agree? The chapel is definitely less traditional, but still worth seeing and photographing. And yes, more of this trip was alpine compared to many of my desert outings.